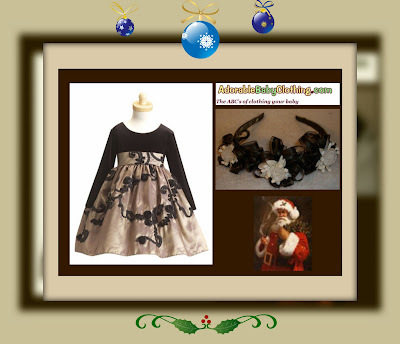 I just purchased my daughter's matching Christmas dresses at www.adorablebabyclothing.com along with gorgeous headbands to match! I usually get the pictures taken in November to give me enough time to make my Christmas cards and calendars at Zazzle.com. What I love most about Adorable Baby Clothing is the awesome customer service. I was going to hold out for the sales at the local department stores but it's so difficult to get two matching dresses in size 3T and 8. Luckily, with the dresses at Adorable Baby Clothing, the sizes are readily available when you select the dress so you just click the drop down box to see what is available. The selection is amazing and the dresses range from traditional to modern. They even have great outfits for boys which to me, would seem hard to find something that is stylish yet great looking. I'll post a picture of the Christmas pictures with the girls wearing them once I get them taken. Don't forget they have a great Halloween selection as well as every day wear, special occasions, personalized and much, much more!